An artist, maker, and Philadelphia preschool teacher, Kate Leibrand is the creative force behind TWEE - a company specializing in handmade, small batch, sidewalk chalk. The name TWEE stems from her art school critiques; after repeatedly being told her work was too “twee” or “cute” Kate began to wonder - What was so wrong with that? Instead of changing her aesthetic, Kate embraced it. All TWEE products are designed to perfectly fit little ones’ hands, helping to increase a child’s grip strength and fine motor skills while encouraging creative play and imaginative making. What started as a project in her kitchen has expanded into a small, woman owned and run business whose products are carried all over the country. Besides, who wouldn't want to draw with a donut? As easy as A-B-C! What could be better for drawing and learning than a full set of rainbow alphabet chalk? These hand-made ABC's are made of 100% usable chalk. A sweet treat for outdoor drawing! 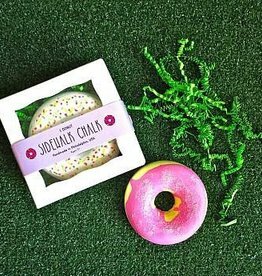 This hand-painted donut is made of 100% usable chalk including all decorative toppings. 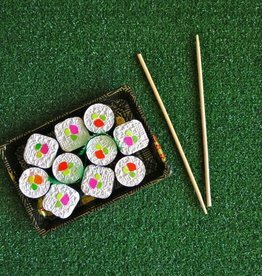 Roll into Spring with ten pieces of our brand new, limited edition Sushi chalks! All hand-made rolls are made of 100% usable chalk. 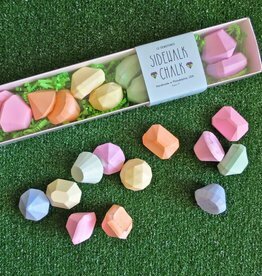 You are sure to be the envy of the playground with these hand-made gems made of 100% usable chalk.